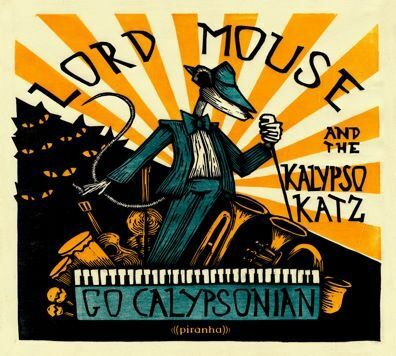 I'm listening to the new album by Lord Mouse and the Kalypso Katz having just visited a website called The Race Card Project. The site allows anyone to submit a six-word sentence that describes their relationship to race/ethnicity. "Guessing my ethnicity is not a game," reads one. "But you don't look Puerto Rican," asserts another. This is the kind of tension the thoughtful listener might ponder upon discovering the music of Lord Mouse and the Kalypso Katz -- a singer from the USA with mostly white band adopting a musical style from Trinidad. To their credit, they address this head-on in the track "White Boy Calypso," in which they answer the musical question "White boy why you sing / songs of the Caribbean...?" with "in song, there is no color that's wrong..."
Is this enough to answer charges of cultural expropriation? Perhaps Lord Mouse should simply have taken a page from The Daktaris. You may know their story: A group of mostly white NYC studio musicians made an Afrobeat album back in 1998, masking their identities with obscure liner notes and fake Nigerian names. Some cried foul, but the music was great, and was a key step towards the current Afrobeat revival that now finds many major USA cities with their own Afrobeat ensembles. Some of the Daktaris themselves now find a home in the genre-leading group Antibalas. I can't disparage Lord Mouse for taking a more direct (and honest) approach to breathing new life into a musical genre. The band's website relates how calypso was largely unknown in Europe (they're based in Berlin) and how they're helping create a following for this traditional musical style. “Our orchestra hails from around the world," says Lord Mouse, "and we’ve been pushing this cause and none of us are from the Caribbean. The folks here in Berlin are really receptive to it. ... The Calypsonian vibe gets to everyone and anyone." And perhaps it will also serve as a gateway to re-discovering classic calypso (check out Lord Kitchener, Mighty Sparrow, and Lord Melody) and re-establishing the form worldwide. Or maybe it will just be one of the most fun global CDs to emerge so far this year. Go Calypsonian is slated for a 9 July release on Piranha Musik.